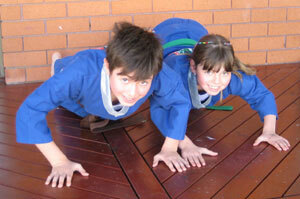 Young martial artists should enjoy doing push ups, like these two tournament champions. My recent article about teaching children martial arts at martialdevelopment.com drew a bit of controversy. Sensei Didi Goodman over at The Kids Karate Workbook wrote a recent post in response to it stating that although she agreed with the idea that exercise as punishment is not a great idea, she supports its use anyway, under certain circumstances. She makes some good points. I will try to refute her opinion here. As she is a friend of mine online and a worthy peer in the field of martial arts for children, I will keep our disagreements about this issue civil and friendly. Here is the biggest reason I do not support exercise as punishment—it discriminates. Against who, you ask? Let me explain. Scene #1: You have a class full of children doing their martial arts drills. One boy is constantly poking other children and doing exactly what you told him not to do five minutes earlier. You say “drop down and give me ten push ups”. He smiles at you in a challenging way, drops, cranks them out, and pops up as if to say “next”. Although you carry on with the class and try not to make a big deal out of it, the other kids can’t help but notice he is really enjoying it. Why? Because he has now just demonstrated his physical prowess in front of the whole class. What lesson has he learned? That next time he misbehaves it will be another opportunity for him to show off, and also gain the attention of the other children in the class; which is why he started acting up in the first place. Scene #2: This time your misbehaving child is slight and weak. He experiences real pain and discomfort as he struggles with the pushups, and now has the added ridicule of the whole class because he can’t do them. What have you just taught him? That exercise will always be a source of ridicule and pain. He will grow to hate not only your martial arts classes, but also exercise in general. Although punishments should be uniform in order to fair, in this instance it discriminated against the weaker boy and rewarded the stronger boy. If you give the weaker boy less push ups to do, people will say you are not being fair, never mind the added humiliation of giving him a lesser number because he can’t do them. Which boy really needed to exercise the most? The weaker boy. Isn’t that just plain wrong? Didi states in her post that you have to differentiate between punishment and discipline. I believe there is no difference. If exercise is used to enforce rules in the martial arts dojo, it is punishment, no matter how you look at it. The reason it is punishment–you are singling someone out for special treatment as a result of their behaviour. It is not conditioning, as some might call it, unless the whole class is doing it together, and with the knowledge that it will help them in their relevant sport. Many states in the U.S. consider using push ups or other exercise in this way to be corporal punishment. It is against the law, because for many, it is painful and humiliating. In the end, it sends the wrong message to kids when they are at a very important stage in their development. A good teacher will find better ways to motivate children, like catching them when they doing something right and praising them. Let’s make sure we send our kids the right message about exercise, so they can grow up fit and healthy. Check out Didi’s excellent blog at The Kids Karate Workbook for a balanced opinion on this subject. She is one of the true experts in the field of martial arts for kids. In the meantime, I would like to hear your thoughts on this issue, so don’t be shy. Teaching Children Martial Arts: Exercise as Punishment is an original article by Sensei Matt Klein. Punishment is set by others if you don’t have self discipline! Hey Matt I can see your point here. This idea might be a bit far fetched for your purposes, but when I was in the navy and someone got out of line, not only was that person punished, but the rest of us were also punished right along with him. This helped develop a sense of team work and responsibility. What would happen if the next time one of your students started cutting up, you dropped the entire class for pushups on account of the one? I think that might drive the point home much quicker than punishing one person for what he did wrong. Thanks for your insights Dustin. Yes, peer pressure has a way of bringing people into line, especially when you need to form a tight, cohesive group like in the navy. Think that it’s a bit extreme or far fetched like you say, for kids. Reading your thought provoking post has reminded me of a couple childhood experiences. When I was in fourth grade – I was that kid who disrupted the class with my jokes. My teacher at the time, Mrs. Brown, called me up to the front of the call and bent me over her lap and spanked me! I had two choices as it hurt… cry or laugh… as I was in front of my friend I decided to laugh… boy did that upset old Mrs. Brown but finally she sent me to the principals office – acquiescing defeat! The second memory was in sixth grade, we had the 3 tardy rule. After one was late to class three times – we got to meet the board of education… one with holes drilled through it to to make the wackes harder! I believe I’ve illustrated your points and while I don’t think there is anything wrong with corporal punishment (at least in my era), I do agree it is not as effective as operant conditioning (using positive or negative reinforcement). Hi Sue, so true about the effectiveness of time outs. Never really thought about the need for rest–brilliant insight on your part. Thanks! John, that was one potentially humiliating experience that you handled with aplomb. Better the wrath of the principal than the riducule of your classmates (that lasts a lot longer). Unfortunately, the principal of our school was an ex middle linebacker that could wield his hole-riddled paddle with serious attitude-adjusting power. Mixed feelings about corporal punishment and its effectiveness. Thanks John! Hi Matt, I totally agree with your logic and reasoning on this issue. I remember a view years ago when my eldest son was about 16. Some boy had been repeatedly misbehaving in sports class at school and as a punishment the whole class had to do 100 push ups. The next day my son’s arms were so sore he was unable to swim properly in his squad class. He explained what had happened to his swim coach and the coach was furious – he said it was illegal and the teacher should be reported. I didn’t report him, but I’ve never forgotten it and have little respect for the teacher to this day. And the interesting thing, my son didn’t blame the misbehaving boy, he blamed the teacher. The teacher earned no credits from anyone that day and likely lost a lot. Thanks for another good read. Hi Jan, your son understandably had a right to resent that instructor in the sports class. Imagine if you were paying him to teach your son each week. How long would you and your son stay there? Great story Jan and thanks. I agree with your point but what I like best about your post was your considerate and respectful attitude towards someone who has disagreed with you online. There can be an astonishing amount of derision and vitriol thrown during arguments online in particular, so thank you for showing us how to make your case gracefully. Welcome Rachel and thanks for your insights. Yes, I have been in a few disagreements online, but as a martial artist respect for others is first and foremost. Friendly debate is what makes for an interesting blog. If this in fact the real Cro Cop Mirko Filipovic, I am honoured to have you visit my blog. You have kept me and many others entertained with your fighting skill and spirit. I say, keep it up yourself! Top blog, I had not noticed karate-kids.com.au earlier in my searches! This sort of facts should be valued by every person – it’s one thing that I consider we can all draw upon. I incredibly much like the theme you’re applying here which I think is wordpress isn’t it? I’ve been looking close to for something simular but have yet to uncover something suitable for my web site. I looked at the link on your footer and will try and download a copy of it for myself – thanks. Thanks Cosmetic Dentists, you will not find this theme anywhere, because I designed it myself, using Photoshop, Coda, a few other tools, and one heck of a lot of patience. But it is built on the Thesis Framework, which I highly recommend, and which you can get on the footer link. It is a paid theme, not free unfortunately. But well worth the $89, at least for me. You’ve really become a great writer. I remember when I first started visiting this blog and I thought you had a lot of potential. It’s great to see your hard work paying off and it looks like you’re getting a ton of comments. Congrats! Thanks for your support lvn nursing. Very deep and revealing… well written! I’ll def be checking out this blog more often! Thanks for commenting Sean. Enjoyed having a look at your blog too.